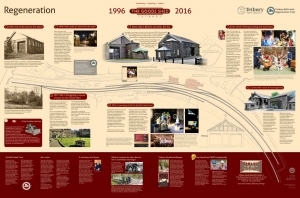 Tetbury Goods Shed is a part volunteer-run arts centre, converted from a former Great Western Railway building in 2017. Generous support from the public and regional donors has allowed us to create a sound framework for the venue, although much work and development still lies ahead. Undaunted, our first season of events kicked off last year. Ultimately our vision is for the Shed to become a regional centre of excellence for the arts in The Cotswolds, while at the same time fulfilling the local need for arts and entertainment. At the heart of the Goods Shed’s vision is the ambition to encourage and capitalise on local talent in all areas of expression; whilst also showcasing dramatic performances by visiting artists. Musical performances cover the full spectrum, including jazz, classical, rock and dance events. The Goods Shed Cinema opened in the spring of 2018, with a programme of films aimed at all age groups and tastes and is providing the town with a new source of regular entertainment. 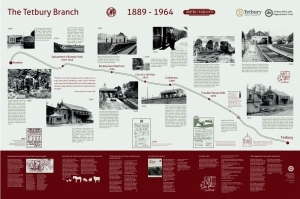 We will have much, much more information and news about the centre as we go along, but to get you started if you’re not familiar with the story of how it came into existence, do take a look at these infographics (click on the images to open PDFs). Don’t miss out on news of upcoming events and other exciting developments at the Shed. Do sign up to our newsletter below. 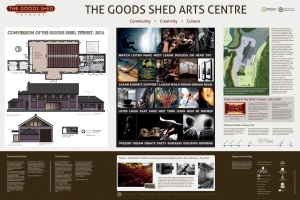 Tetbury Goods Shed Arts Centre has been made possible by the support of the local community for our fundraising activities and appeals, and by funding from donors large and small, which is and will continue to be vital to the Centre.